The only German school in Korea donated 2.6 million won ($1,660) that its 170 students raised by selling the European country's native food and drinks at a Christmas charity bazaar last year. The school's annual Traditional Christmas Market, which has grown into one of the biggest German festivals in Korea, drew an unprecedented number of people last year, completely filling its schoolyard. 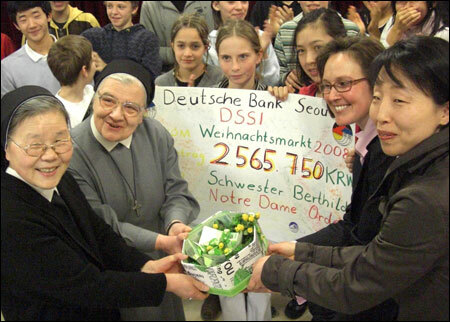 The donation, made Tuesday, will be spent to help handicapped and underprivileged local children, and was given to the Order of the Sisters of Notre Dame, which has actively supported social welfare projects in Korea since 1967. Through its year-end charity event, the International German School (DSSI) has made a donation every year to the Notre Dame group since 2000. Its students also regularly visit the order, where sisters run an orphanage. The DSSI, which receives some 40 percent of its budget from the German government, has recently seen an increased number of students, due largely to its efforts to cope with its shrinking student body and the Korean government's changed education policy. The eased-education regulation, which came into effect late January, allows Koreans with three years of overseas residence to apply to foreign schools, down from the previous five years.